Arsenal secure a place in the FA Cup semi-finals with a 4-1 win against Everton at the Emirates Stadium on Saturday. Two goals from late substitute Olivier Giroud and one apiece by Mesut Ozil and Mikel Arteta secured Arsenal’s place in the FA Cup semi-finals with a 4-1 win against Everton at the Emirates Stadium on Saturday. Ozil gave Arsenal a seventh minute lead, after a precise through ball from Santi Cazorla but Everton equalised after a surging run from Ross Barkely resulted in a Romelu Lukaku tap-in after 32 minutes. Arsenal regained the lead in the 68th minute after Gareth Barry tripped Alex Oxlade-Chamberlain in the box and Mikel Arteta converted the penalty. Striker Olivier Giroud then came off the bench to score twice in two minutes, in the 83rd and 85th minutes, to keep Arsenal on course for their first trophy for nine years. In an end-to-end cup tie it looked as though the visitors might force a replay but Arteta’s penalty was the turning point in the game, forcing Everton to push forward in search of another equaliser, leaving themselves open at the back. The Spanish midfielder, who left Everton for Arsenal in August 2011, was forced to retake his initial penalty after Giroud encroached into the box and admitted it was a big moment for him against his former club. Arsenal now enter the draw for the semi-finals at Wembley with high hopes of winning their first major trohpy in nine years. They won the FA Cup in 2005. “It will be amazing if we can win it. 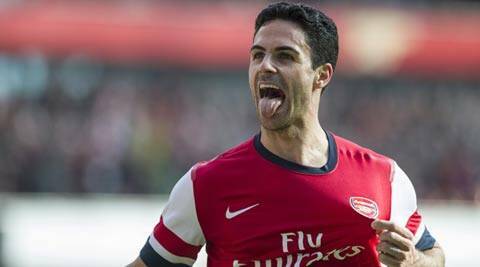 We’re in the semi-final, have a good chance and want to do it,” Arteta said. The rest of the FA Cup quarter finals will be played on Sunday. Sheffield United host Charlton, while Sunderland travel to Hull City, and Manchester City welcome Wigan Athletic in a repeat of last year’s FA Cup final.